I know we are supposed to be eating “by the seasons” and as much as able, I try to put this into practice. But I don’t have four seasons to play with. I have two – summer and rainy. Summer — when everything is sweet and gorgeous, and Rainy (or “wet”) — when everything is um, wet and um, not so gorgeous. Right now, I can’t even tell…we are supposedly in “rainy” but there have been bouts of mysteriously scorching days. Sigh. Well, this crazy weather can do what it wants and so will I. For now I’m declaring “autumn” in my flat – a season that I have always wanted. You may remember my jubilant discovery of butternut squash at a neighborhood market – like autumn, not something I bump into everyday, at least not in these parts. You may also remember, much more recently, my last post – where I declared my love for ham stock. This is where the two come together to make one powerful statement of a soup. So here in my little corner of the Philippines, though all the leaves are not brown, and fall coats can not be worn, this is my autumnal declaration. – Cut squash in half, scrape out seeds, and place on a baking tray in a 200C oven. Roast for about 45 minutes or until soft. – When squash is soft, scrape meat out of its skin into a bowl and add stock. Blitz with an immersion blender, or simply toss squash and stock into a blender or food processor and process. Add only half of the stock at first, and just keep adding until your reach the consistency you like. – Heat a small amount of olive oil in a pot or sauce pan. Add bacon and sauté until just turning golden around the edges. 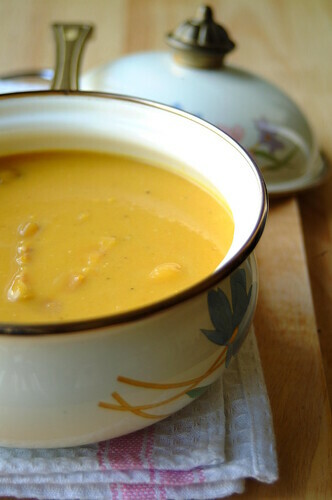 – Add squash/stock puree, thyme, and black pepper, and then cook slowly to let the flavors develop. Add salt if needed. Stir in cream towards the end of cooking. – Serves 3 (serves 2 for dinner with an extra leftover serving for the next day’s lunch!). Can also serve 4 as a small first course. This is inspired (in particular) by my longing for a full-blown, leaves-swirling, theatre-like autumn…and my love for squash soup (in general). The use of ham stock here is inspired by my favorite squash soup in town…which I always thought had the essence of something meaty and smoky in it. In any case this one had a taste all its own – the aromatic ham undertones bolstering the rustic soft-sweetness of the squash, all veiled in a gentle smokiness from the bacon. The thyme was the perfect complement to round everything out. This is my kind of squash soup.